Panasonic entered into a long term partnership with National Trust in October 2014, under which Panasonic technology will be used to help enhance the experience for National Trust visitors. The latest Panasonic technology will be used to allow visitors to delve deeper than ever before into the unique stories of National Trust locations. Our interactive technologies create atmospheres and movements that bring exhibitions to life, making it easier to imagine what it would have been like to live or work at one of the properties. Panasonic’s ranges of user-friendly cameras are also used by National Trust, to capture and communicate people’s unique visits and relationships with the venues. To this end, Panasonic has equipped National Trust staff with the latest Lumix cameras to help them share with visitors exactly what it is they do to help preserve the sites. Panasonic also works together with National Trust to inspire individuals to capture their own memories with exciting content, special offers and new ideas. 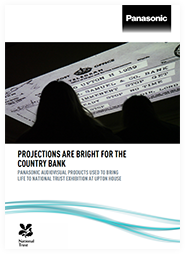 One example of our work with National Trust is the Banking for Victory exhibition at Upton House. It tells the wartime story of the Bearsteds, who moved out of their family home near Banbury to allow the family owned Bank to move in. Driven by the need to protect staff and assets from the London air raids, M. Samuel & Co., moved in lock, stock and bought ledger, for the duration of the Second World War. Panasonic has helped bring the exhibition to life, by providing high resolution projection and display technologies that add interactivity, atmosphere and movement to the exhibition at Upton House. As well as using technology to enhance visitor experience and capture special moments, Panasonic’s innovative eco technologies will be used by National Trust to help achieve a goal of moving towards a greener, more sustainable mode of operation.